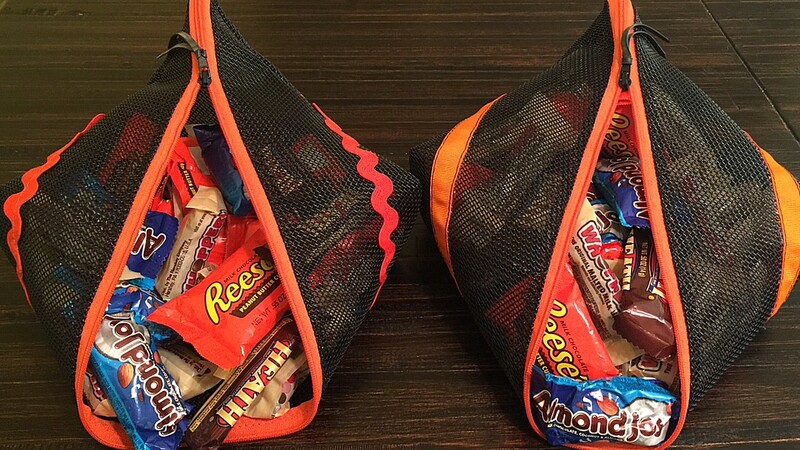 Just one 18″ square of vinyl mesh and some rick rack, ribbon, a zipper and two zipper pulls made these Spooky-Sweet Treat Pods of Deliciousness. You’ll need to use Sullivan’s Make-A-Zipper On A Roll and cut it a few inches longer than the longest side of your triangle (see pattern for cutting instructions). Also keep in mind– if you’re going to swap out the zipper pulls to a different color than your zipper tape–you must be sure to use the SAME BRAND and SAME SIZE pull as the tape. Test your zipper tape and pulls for compatibility BEFORE using in your project. Not all zipper brands will work. It’s SEW FAST and SUPER EASY to make this super-sized babies because you omit the interfacing and lining steps! For the zipper pull strings, I used thin strips of recycled bicycle tube. 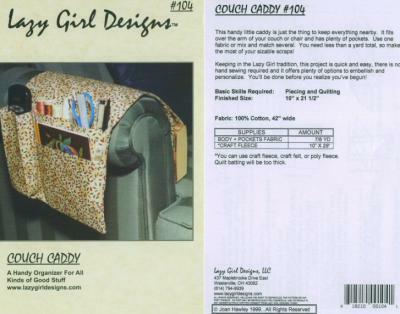 If you don’t have the LazyGirl Sweetpea sewing pattern yet, get it ON SALE NOW. Click here and order yours today. Using mere scraps of leftover fabric, some thread, some Stiff Stuff and some buttons, I created colorful ornaments and gift card holders using the Lazy Girl Designs Gifty Card Holder sewing pattern, ON SALE NOW at SewThankful, click here to order yours. You could use this style as a package gift tag as well. And the recipient of the gift can recycle it for future giving…it’s like a 2fer. NOTE: Stiff Stuff is currently sold out and unavailable from the manufacturer. They expect to have it available again in mid-late October this year (2017). I suggest substituting Soft & Stable until Stiff Stuff becomes available again. I thought I had posted this pattern on our blog last year after I sent it out in our FREE eNews, but apparently not. 🙂 Holiday haze, I guess. These are very quick and cute and make excellent use of small denim pieces! They look great on the tree (or decorating a package) and as always, because they are fabric they don’t BREAK. They look great embroidered, beaded and blinged out! 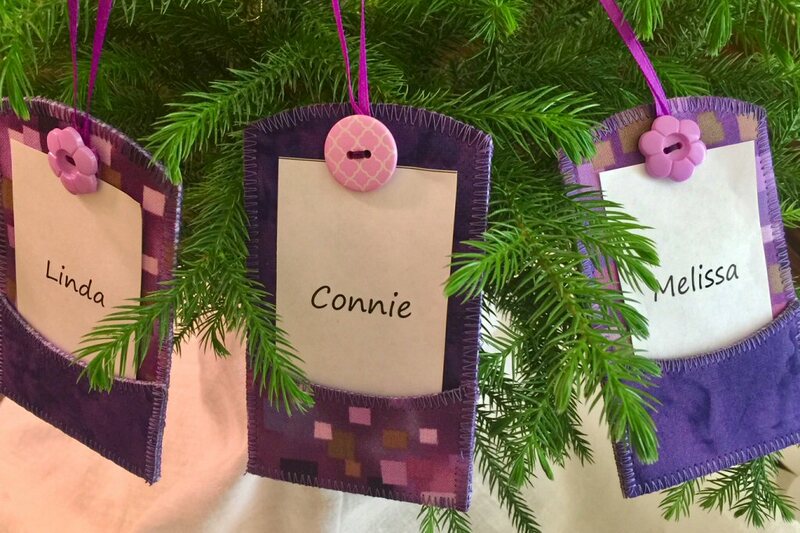 Use your imagination to make truly customized ornaments. 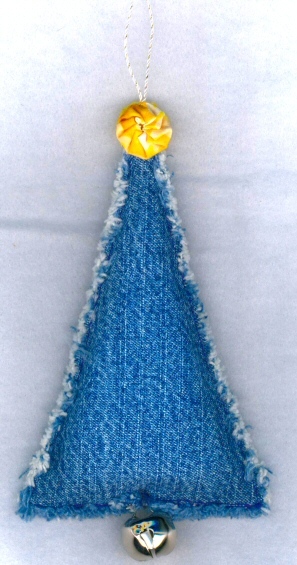 AND…if you’ve got colored denim scraps laying around…YES…that works beautifully too! Here is the link to the PDF pattern/instructions. Here is the link to the PDF pattern/pieces. ©Tracy L. Chapman & Sew Thankful Inc. December 2013. All rights reserved. Permission to print and distribute this complimentary pattern at no charge to others, for personal or NON-PROFIT use, for guild and group projects is granted provided all copyright information and references to Sew Thankful are kept in tact one each and every pattern copy printed/distributed. Permission is also granted to individual crafters making small quantities of finished items to sell at their own individual craft fairs, boutiques, etc. Tracy L. Chapman, Sew TracyLee Designs & Sew Thankful Inc. shall have no liability with respect to loss or damage caused directly or indirectly by the information contained in this project. Each person using this project is responsible for their own risk and results will be determined by many factors including tools and materials used, and individual skill level. No guarantees or warranties are either expressed or implied. SEW THANKFUL and the SEW THANKFUL logo are a federally registered Trademark/Service Mark of Sew Thankful Inc. Introducing Betz White sewing patterns! See these and MORE Betz White sewing patterns and SAVE at SewThankful.com, click here.